Nearly two millennia ago a large group of people settled into the region known today as Teotihuacan, creating a thriving city with highly organized urban planning and a large sphere of influence in the pre-Columbian world. Even after its decline the Teotihuacan civilization has been admired by many; the Aztecs, never having encountered the original inhabitants, named it “The Birthplace of the Gods”. This terracotta piece is in the shape of a dog curled in a seated position, with the greater part of the body forming a bowl. The head is formed at the end of a long neck and pressed against the body in a position of a warily alert dog. Triangular ears are splayed open and positioned slightly back, while the snout is upturned to display bared teeth, warning the viewer to keep their distance. The dog’s eyes are outlined with thick eyelids, underscored by the lip. The bowl itself is highlighted by a gently curving distinct spine that also forms what appears to be the tail. Front paws resting beneath the raised chin, and a raised leg on the bowl’s lower curve, mark the means of locomotion for the original model. 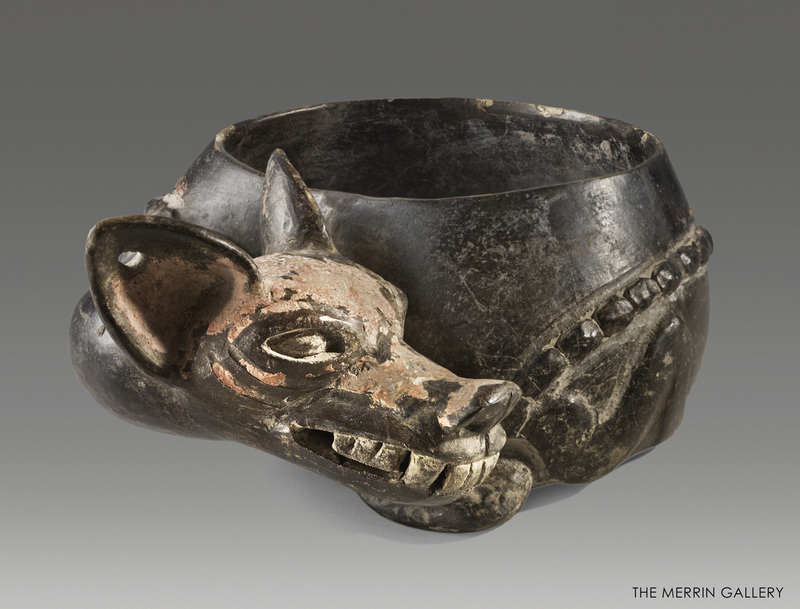 This bowl bears incredible resemblance to the Xoloitzcuintli (also known as the Mexican Hairless Dog), a breed of dog that has lived alongside humans in Central America for more than 3500 years across a range of pre-Columbian and modern cultures. 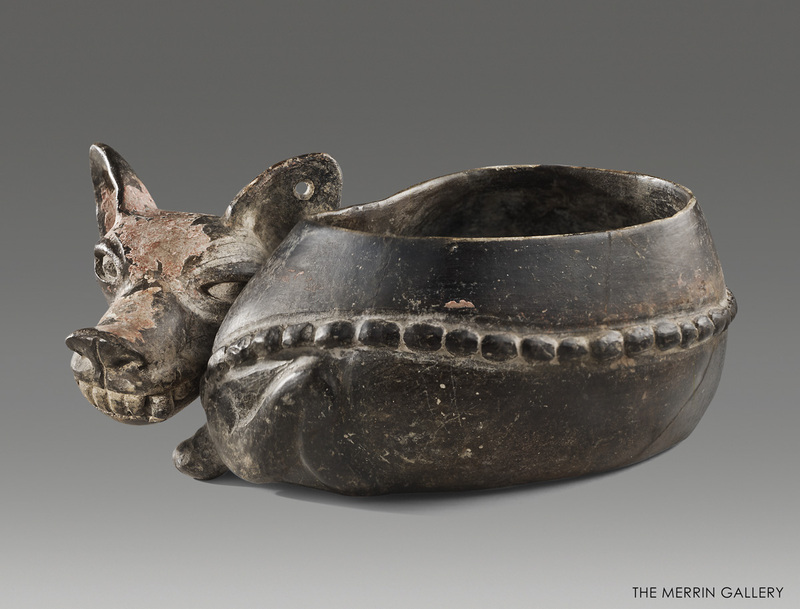 The dog breed itself has naturally occurring dark skin, reflected in this piece by the black slip over terracotta. This breed of dogs has been used to guard against intruders both ordinary and supernatural intruders and is still believed to have healing qualities for which it is held in high esteem.